The Czech writer and playwright Jaroslav Rudiš was born in the Bohemian town of Turnov in 1972. After studying German and history in Liberec, Prague and Zurich he worked briefly as a German language teacher until he received a journalism scholarship that brought him to Berlin. In his first novel, »Nebe pod Berlínem« (2002; tr. The sky beneath Berlin), Berlin’s underground becomes a gathering point for street musicians, suicide victims, conscientious workers and homeless drifters. Rudiš creates an unusual, tragicomic world, populated by outsiders he cares for very deeply. »Hrabal is clearly one of my role models, even in the way he expresses himself. But also the theme itself: these lesser heroes and their view of the big wide world; who know more than most intellectuals. Minor heroes and outsiders: that’s my world.« His second novel, »Grandhotel« (2006; tr. Grand Hotel), is the rather bizarre story of another outsider – a marooned temp named Fleischmann (Meatman) – who lives in the tip of a 90-meter-high missile. He dreams of escape, but repeated panic attacks prevent him from leaving. Rudiš penned the screenplay and played a supporting role in the eponymous film, which was made in the Czech Republic in 2006. In his novel »Potichu« (2007; tr. The silence) the interwoven narrative of five different characters captures the spirit of the Czech capital. »Národní třída« (tr: National Avenue) expresses a sentiment shared by the majority of Czechs whose hopes of a better life were dashed in the wake of Communism. In »Konec punku v Helsinkách« (2010; tr. The end of punk in Helsinki), after Ole’s bar »Helsinki« is closed down, he travels to the Czech Republic to face the darkest moment in his past: 1987, when he attempted to flee across the »green border«, and Nancy died as a result. 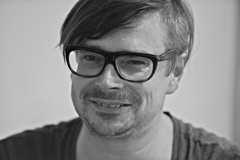 Rudiš has also written the German language audio dramas »Lost in Praha« and »Plattenbaucowboys« (Conrete Jungle Cowboys) with Martin Becker, which were broadcast by »WDR«, in 2008 and 2011 respectively, and the opera libretto »Exit 89« (Berlin and Prague, 2008). Jaromír Švejdík and Rudiš co-created the cartoon character »Alois Nebel«, whose gloomy adventures in the service of the Czech Railway – and under the influence of a great deal of beer – were made into an animated film that won the European Film Prize in 2012. Rudiš has also written numerous theater plays with Petr Pýcha. His debut novel received the Jiří Orten Award, and in 2007 he was named one of the Czech Republic’s thirty most important people, alongside politicians and important public figures. From 2012 to 2013, he was a Siegfried Unseld Visiting Professor at the Humboldt-Universität zu Berlin and, in 2014, he received the Usedom Literature Prize. In 2013, he formed the Kafka Band, who set »The Castle« to music. He lives in Lomnice nad Popelkou and Berlin.